There is so much in the world at present that makes me sad. That fills me with rage. That reminds me of my smallness. That waves my fragility at me like a flag. I never know whether I should write about those things here, whether it’s appropriate as a writer, and specifically as a writer of genre fiction. So as I ponder that, let me give you something that makes me happy. In just over four weeks, Private Politics will be out. 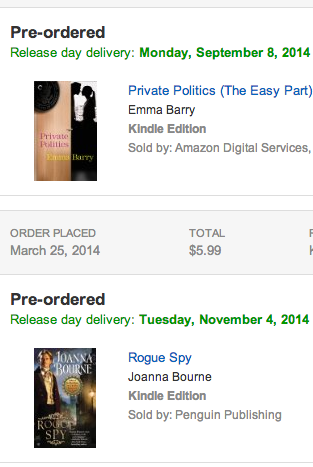 And it shows up in my preorders along with Joanna Bourne. Tee-hee. I feel that way too, and I don’t even have a writing blog! Lol. I can’t decide whether to post on those things. I am watching what’s happening in Ferguson, Missouri, and on Mt. Sinjar, Iraq, and elsewhere and thinking things about it…so should I write about those things on my blog? But do I have the authority to speak on those subjects? Can I add constructively to the conversation? Is it a distraction from the other things I write? Etc.